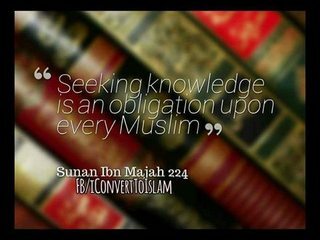 It was narrated from Anas bin Malik that the Messenger of Allah (ﷺ) said: "Seeking knowledge is a duty upon every Muslim, and he who imparts knowledge to those who do not deserve it, is like one who puts a necklace of jewels, pearls and gold around the neck of swines." Allah's Messenger (peace be upon him) said: The seeking of knowledge is obligatory for every Muslim; and the imparting of knowledge to the non-deserving is like putting necklaces of jewels, pearls and gold around the necks of swine. Transmitted by Ibn Majah and Bayhaqi in Shu'ab al-Iman up to the word "Muslim" saying: This is a hadith the text of which is quite well known but the chain of transmission is weak. Question: What is the classification of this hadith? I don't really have a good grasp of what all this means, and perhaps the hadith sciences are not as one-dimensional (i.e., "this hadith is good", "this hadith is bad") as I sometimes expect. Ruling on parents killing their child? Hadith: Blood of Muslim is more sacred then the Kaabah?